.Turning Fifty is NO Fun! I DO have to make one apology...............I asked Andrew to take my photograph this afternoon and unfortunately I had only just returned from the hairdressers where they renewed my hair paint and gave me a general "tidy up"...........so I am not sure that I quite fit the bill really..................but therein lies the truth...........ie..........................that NONE of us DO fit the bill do we? As a 50+ year old I have some great friends both near and far generated from my work place both present and past and my hobbies, church attendance etc.....................so why do I need to "make new friends"? Another thing - I have no need of any "hot flush relief" either..................................but if I was......I wouldn't be perusing the adverts for such a thing online........so WHY do online advertisers plague me with them once they know my age? This isn't going to be a long rant......sorry meant to say "blog"! I was not intending to blog today but last night a "targeted add" on Facebook really annoyed me. It is quite bad enough to be targeted cos, at fifty, you are presumed to be, if female, ............................virtually incontinent and disabled from constant hot flushes and heavy sweating day and night................................but also to have an "elderly parent" who is plainly in a much worse condition than yourself........if you can believe that after all the kind of targeted advertising you are bombarded with. I am referring to one particular advert that hit me between the eyes.........and it read something like this..............."Do you need to find somewhere for your elderly parent? "...........and the answer for me is a big NO! Both are dead and buried sadly............................but even if they weren't I would not feel much cheered up when logging into Facebook to see THAT advert staring me in the face! I would love to change my age and see what lovely adverts I would be targeted with if I was a young nubile 18/21 year old girl.................................................umm..........I can just imagine..........make up............fashionable clothes.....................night clubs.............................................so WHAT is wrong with us all when we hit 50 that such options are no longer considered? I guess "fashionable clothes" went out the window when incontinence pads came in.............................................and night clubs.............well...............people of our age just don't "go there" any more do we.................? I now have to make a confession and you will all think me very sad.....................................there is nothing I love MORE than a nice evening in and then rounding it off with a nice piece of marmite and soft cheese on toast all washed down with a hot sweet milky drink.......................but that is NOTHING to do with my age...............................................I have ALWAYS been like that! Once you have turned 50 there is every reason to say you almost NEVER forget how old you are... because society loves to remind you...... I can say that today was certainly one of those times. You see................we took our usual Saturday morning trip out and Andrew, my hubby, needed to go into the bank. So I waited for him.......................but as I waited for him I found myself picking up two leaflets for ISAs ( for my international visitors this is a tax free savings account) and no prizes for guessing that one leaflet was for................................................."Normal people" and one for the "Over the Hills"!! OKAY..........I have to admit that they were not really called that - but they may well have been because the one had to have the old "over 50s" in its title which gets my goat straight away..........and to suggest it is a "great move" when for the "normal people" one it has a nice sensible statement that simply says it is a fixed rate account". You see...........WHY patronise us just because we are "over 50"? Are we really no longer capable of reading and comprehending normal English? Hope you like my new "hair style" too. I WAS trying to change my hair to a lovely "blue rinse" but this was the best I could achieve........................and now this is my special advert for all of those "Normal People" who have yet to hit the dreaded 50! I was just SO annoyed to pick these two bank leaflets up and see that they had the SAME cartoon woman in each one.......but on the "over the hill" version she had grey hair in pig tails and glasses whilst "dancing in ballet shoes. 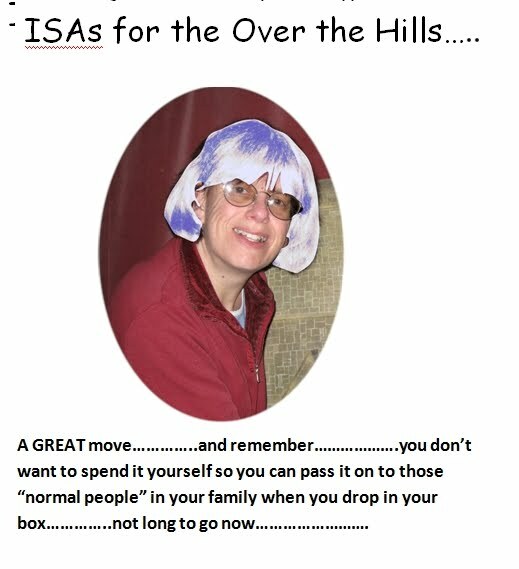 I suppose we should be pleased that the "over 50s" are still able to dance I guess as on the "normal" leaflet. Just turned 50 and my computer has morphed into an alien creation……HELP! Have NO fear…….if, when the clock struck midnight, you turned 50, this article is for you…………but IF you have yet to hit that dreaded 50………….this WILL be a valuable aide memoire………..because as sure as eggs are eggs…………this WILL happen to you too……..be VERY afraid…….VERY afraid……….. There you were yesterday……………tapping happily on your computer keyboard as you emailed your friends and family etc……………………you edited your home website and uploaded the revised pages to your domain web space………………………….. Suddenly, at the stroke of midnight, you turned the dreaded big 50………………..and so what WAS previously familiar to you suddenly becomes an alien being………….something that could have been delivered to you from Mars…………….and you seriously need……..HELP! Have no fear because this article is especially for you! Calm down……….go and make yourself a nice cup of tea………………….IF, of course, you still remember how to make one! I do realise that, having turned 50, you will have forgotten that letters come in different FONTS……………….no – don’t worry if you have no idea what a font is………….all will become clear later on……. Are you sitting comfortably? Then I will begin. Make sure you are sitting in front of your computer. Now you have already done very well because you have actually remembered that it IS called a computer………….WELL DONE. Can you see your mouse? Sorry about that…………..I should have provided you with a picture of one because, as I said earlier. everything to do with your computer may as well have been delivered from Mars…………………………………so here is a picture…………………. Oh dear……….I sense you are very confused……….because this mouse probably looks different to yours……….but you see……….this is MY mouse and NOT yours! They all can look a little different so yes…..they can be a bit scary at times………… My mouse mat is very helpful to me since I turned 50 too. It provides a stark warning to all those at work who want to ask me a question………..because turning 50 means you can no longer give an answer because you may have heard and seen it all………..but it is ALL forgotten! Many think that I haven’t turned 50 yet but I have to tell them that it is all down to such trickery as hair paint and a clever hair style that covers up all those tell tale wrinkles! As to the saggy bags under my eyes………simple……..my grey tinted spectacles resolve that problem too! Where was I? 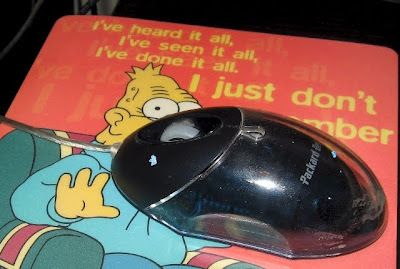 Oh yes……………..you now know what your mouse looks like. Can you see a “screen” or “monitor” as it is often called? You have forgotten what one of those looks like too? Never mind…….help IS here…………..and just so that you know what one looks like this is MY screen……..but remember it IS mine so it may not look quite the same as yours! 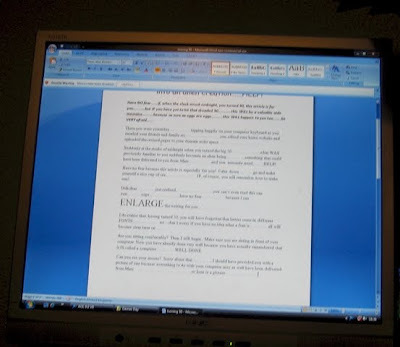 The monitor is where you are able to see what you type when you write an e-mail. Oh dear, you have forgotten what an “e-mail” is too. Never mind, I will explain. E-mails are electronic letters! Oh no…you don’t know what the word “electronic” means now, sorry about that but all will become clear soon. I have just realised! You don’t know what a keyboard is! HOW can you type an e-mail if you don’t know what a keyboard is and looks like! So here is another picture. Now remember that again this is MY keyboard and NOT yours so it may look a bit different and yes, just like the mouse it may be a bit scary but it isn’t really once you get used to using it! I am now going to explain how to execute THE most important thing you will need to know if you are to use your computer EVER again and that is……… to turn it on! You can see MY computer’s “on” button on this picture. DO remember though……………..it may look very different to yours so again…… just a little bit scary. If that is the case…..take the opportunity now to make yourself ANOTHER cup of tea or coffee and chill out as you try to take in all the new things I have covered with you. 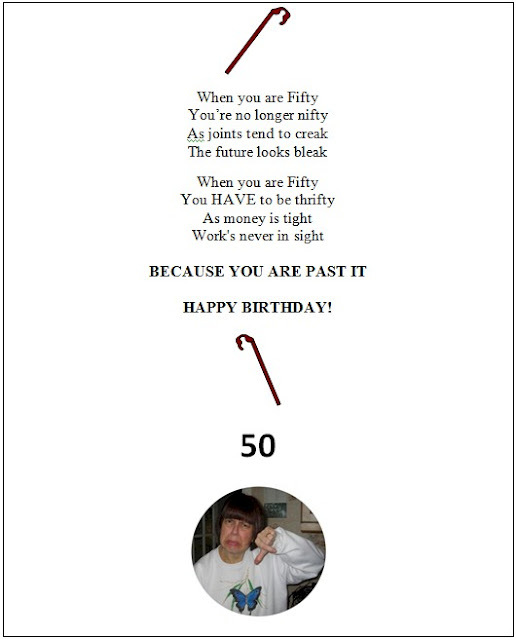 Did I say “new” – well they will feel like that ….after all……….you ARE now 50! Ah………you have returned. Well I am sorry to tell you but it is now MY turn to have a nice break and cuppa so I suggest you go to one of those lovely book stores and buy one of those computer books written ESPECIALLY for folks like us who sadly lost all our marbles and sanity the minute we turned 50! 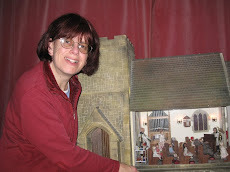 Dedicated to all those misguided authors who really DO believe that everyone becomes blubbering stupid morons at the age of 50 and are no longer capable of understanding complicated instructions and therefore need specially written books to cater for their failing eyesight and comprehension skills……………..
Me, Sarah with my miniature church, St. Hils! Trying to look less than 50 with the aid of hair paint and tinted glasses! ......you STILL have your marbles and more. 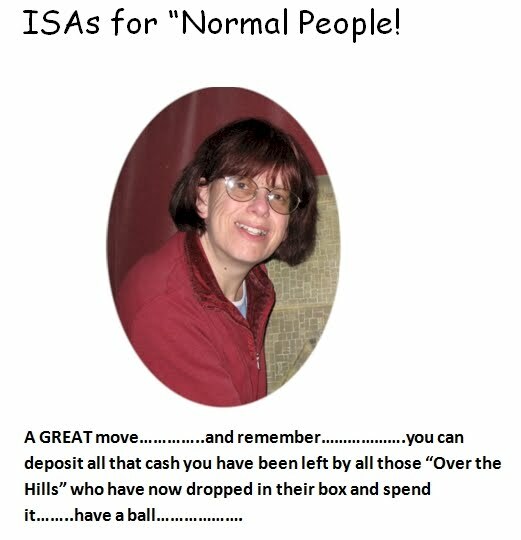 I feel compelled to share some of my pet hates that have surfaced particularly after I hit 50 a couple or so years ago. I have a particular distaste for society's desire to stereotpye everyone by their age, gender, race, colour or faith ...........but my biggest gripe is.........AGEISM! You could call this....."Less of a blog and more of a rant......."!